The USPS® offers a service called Return Receipt that gives you peace of mind by providing evidence of delivery in the form of a postcard signed by the recipient or an e-mail with an electronic copy of the recipient’s signature. Return Receipt is available for Priority Mail Express®, Priority Mail®, First Class Mail®, First Class Package Service® and Media Mail. The cost of Return Receipt is $2.80 for a mailed receipt or $1.60 for an electronic receipt that is emailed to you. It can be combined with extra services including USPS Tracking, Signature Confirmation™, Special Handling, Restricted Delivery and Parcel Airlift Service. How Does Return Receipt Work? Return Receipt is purchased at the time of mailing. Customers are given the option to purchase a physical return receipt or an electronic receipt. Once purchased, the USPS will return either a physical return receipt or an electronic receipt including the recipient’s signature once the mailpiece has been delivered. In the event that you need to prove that a particular mailpiece has been delivered, you can use the receipt to help prove when your mailpiece reached its destination. To use Return Receipt, the USPS requires a special form which can be obtained at the Post Office™ or from the Stamps.com store. 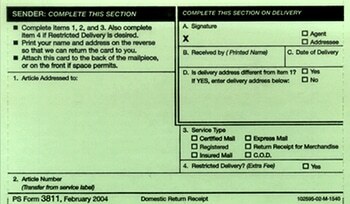 These forms can be filled out by hand; alternatively, Stamps.com also offers special certified mail labels that can be automatically filled out by Stamps.com’s software. Stamps.com makes shipping with Return Receipt more convenient. 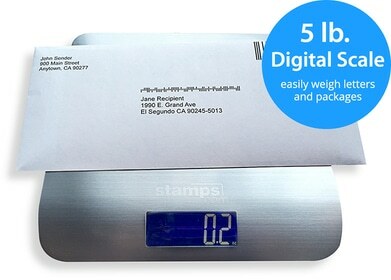 Using Stamps.com’s special certified mail with return receipt labels and envelopes, you can quickly print postage, address labels and Return Receipt forms in one easy step, eliminating time-consuming trips to the post office. You also gain instant, 24/7 access to the other USPS services you need, including Certified Mail™, Signature Confirmation, Restricted Delivery, USPS Tracking and more.